Professor Mary Marshall Clark is Director of the Columbia Center for Oral History Research and co-founder and director of Columbia’s Oral History Master of Arts (OHMA) degree program. Professor Luisa Passerini is a part-time professor at the EUI’s Department of History and Director of the ERC project Bodies Across Borders: Oral and Visual Memory in Europe and Beyond (BABE). Mary Marshall Clark and Luisa Passerini have worked together for more than two decades. ‘I think I first took one of Luisa’s classes in 1994,’ Clark recalls, praising the contribution of her colleague, a part-time professor at the European University Institute, to their shared discipline. The professors are oral historians, leading the way in shaping a new genre of scholarship. ‘We look at memory from multi-disciplinary perspectives, and try to get away from history as told by traditional historians,’ Clark explained. The prefix of ‘traditional’ is, in some ways, damning. History has long been dominated by male scholars and sources, with academic reading lists conspicuously lacking the voices of women and minority groups. There is some explanation for this inadequacy: history needs valid sources, which must be written, drawn, moulded or made. For most of history, the skills to create and resources to preserve such sources lay with men. The privileged few have curated our own sense of the past, consigning the voices of most to the margins of history, according to subjective rules of validity. As a result, historians today face a difficult challenge to democratise the discipline. Yet the future of history looks rather different. Passerini and Clark are cultivating a new scholarly genre which actively preserves the voices, experiences and expressions of those who are otherwise unheard. Oral history is broadly defined as ‘a field of study and a method of gathering, preserving and interpreting the voices and memories of people, communities, and participants in past events’. Yet, in this definition, the past can be remarkably recent. Professor Clark is well-known for the September 11, 2001, Oral History Narrative and Memory Project. She was a co-principal investigator on the study, which gathered over 1,000 hours of interviews to record the experiences and suffering of eye-witnesses, immigrants and others in the aftermath of the event. Similarly, Professor Passerini has been documenting the experiences of migrants in Europe, through a range of sources. Passerini’s team at BABE interviewed 198 migrants aged 16-65 in cities such as Turin, Florence, Mestre and Marghera, from 2013-2016. Their cultural, social and geographical origins are extremely diverse, as were the ways in which they expressed their stories. 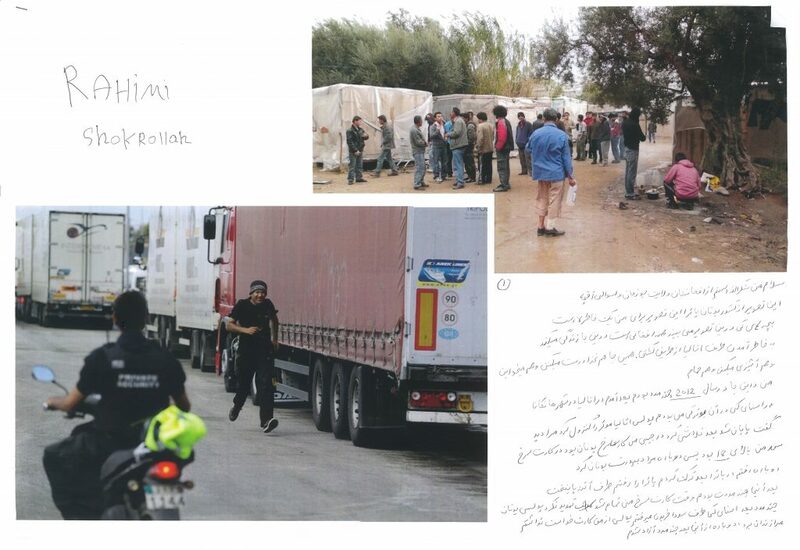 Caption: Rahimi is both a migrant and a real eyewitness for migrants. He photographed his journey to document and transmit memory. Yet whilst Rahimi was eager to pass on his experience, silence, not uncommon amongst those who have experienced trauma, also contributes to a richer understanding of the individual and collective migration experience. Silence, ‘what it is that cannot be articulated into words and cannot be represented in any language,’ also tells a tale, said Professor Clark. Visual representations and ‘mapping’ are also key aspects of the genre’s methodology. 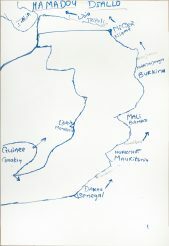 Mamadou, originally from Guinea Conakry, drew a map of his journey (below) when he was interviewed in August 2015. ‘In the many maps we have collected, we can clearly see what we have called ‘trends’ which may be circular, or wavy. Often [the maps are] to be read from right to left (like Arabic writing),’ said Giada Giustetto, a Research Associate on the BABE project. On other occasions, the maps are intended to be read from bottom to top, perhaps for biographical reasons, to show the stages of a journey biographical reasons, or for cultural ones (related to the circular pattern typical of African narrative). ‘In many maps Europe is very small and we have a very large Africa. Italy is cut in two,’ said Giustetto. In this way, the maps give another perspective on our world now. ‘Mamadou’s map is made of departures – returns, stopovers. Consider the position of Liberia and Mauritania compared to the traditional map: here geography is instead marked by personal time and by the chronological order in which he crossed the boundaries. We are facing a proper ‘counter-geography’’ said Giustetto. This summer, Passerini and Clark organised an oral history summer school, part of ‘a beautiful collaboration’ between Columbia University and the BABE, which aimed to uncover the key challenges and innovations within the discipline. The diverse presentations revealed the wide reach of oral history. Erëmirë Krasniqi presented the ‘blood feud reconciliation’ work of the Kosovo Oral History Initiative, whilst Heather Michael, a teacher from Nova Scotia explained how mapping helped her understand and convey the experiences of her teenage charges. It was noticeable that, despite the diversity of topics, amongst fourteen summer school participants, there was just one man. The EUI researcher, Dieter Reinisch, also studies the experiences of women. Oral history is part of a radical democratisation of the vocation of studying the past. It is intrinsically interdisciplinary, challenging the conventions of history. It is close to the social sciences but ‘also linked to anthropology and sociology’, Professor Passerini explained. She told EUI Times that she was also particularly ‘moved and struck’ by one participant’s work on dance. ‘The arts are now firmly ensconced in the methodology of oral history. We cannot do without the arts,’ said Clark. June Cross, a professor at Columbia Journalism School, also presented during the school. Yet oral history ‘is always balancing memory and experience with context,’ Clark explained. EUI historian Heloisa Rojas Gomez, who explores Italian immigration to the Southern Russian Empire in the nineteenth century, found the diverse subjects ‘very inspiring.’ Though the migrants in her study are no longer alive, ‘there is a continuity with these people through their deportation in WWII,’ Gomez said. As well as democratising ‘traditional’ history, oral historians anticipate the challenges future historians will face by comprehensively documenting experiences in the recent past. For instance, Yasmin Mitchel, an oral historian, was involved in the 40 Blocks East Garfield Park project in Chicago. The project sought to fill gaps in the area’s history and build community engagement by gathering narratives of forty residents. In this sense, oral history not only connects individuals and collectives with their own pasts and presents but creates knowledge which would not otherwise exist. The Oral history summer school involved participants from the EUI, Columbia University and elsewhere. The BABE project team contributed greatly to the discussion. Members of the BABE research group, including Liliana Ellena, Leslie Hernández Nova, Gabriele Proglio, Milica Trakilovic, and Iris van Huis, took part alongside Giada Giustetto.